I thought it would be great to introduce some of the top players of DoSplash to the community and the whole internet. 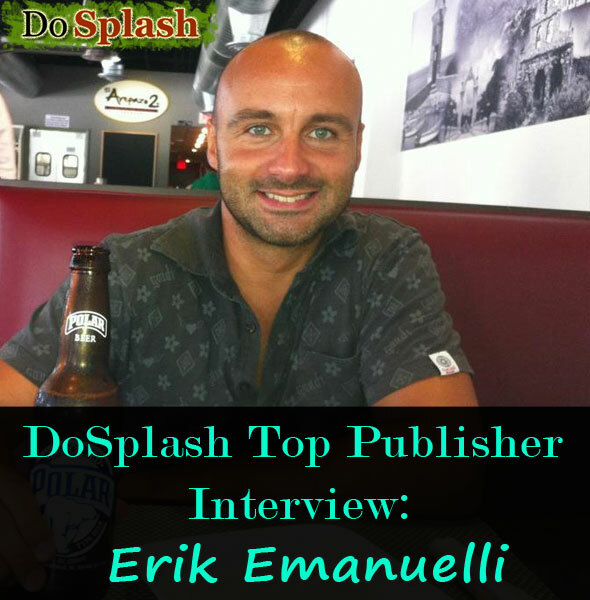 So I have started this interview series which will feature the top publishers and top submitters of DoSplash. This week I have Erik who is one of the first few members who joined DoSplash when it was started and when the site still had some nasty issues. I must say Erik’s support has been great so far. He not only joined the community in its early days, but stuck with us so far. He did not just join to see what’s new here and then leave. He has been an active member and also has helped us very patiently in fixing some of the bugs. I am Erik and I live in a fantastic town close to Garda Lake, in North of Italy. I worked as Export Manager during 8 years for three distinct companies, I traveled a lot, visiting many countries. Since more than 4 years, I started blogging for passion, which turned now into a steady income online. You have bought nopassiveincome.com instead of starting it from scratch. Can you please tell us about it? The founder and previous owner of NoPassiveIncome blog was Chris, a friend of mine. We met online and shared our experiences during his online adventure. Ending 2012, he mentioned about a great chance of working offline, and the impossibility of continuing to run the blog. So he offered me his site. It was great, because he did an amazing work of promotion and content writing during his blogging career. What other blogs/sites/projects do you run apart from nopassiveincome.com. In general let us know about your online presence. My first blog was “Free MAKE MONEY Advice” : my first joys and sorrows. I made some huge errors at the beginning of my blogging journey. I’ve tried to recover it, but Big G updates hit very hard. Then I own “TOKYO ezine“, about Tokyo and Japan, with guide, trends and travel information. It has a steady niche and targeted traffic. Another blog is “Fill My Money Box“. It’s about Finance, Business and Making Money Online. I monetized it in many different ways and I still receive decent monthly income. I run also “How to Quit WoW“, a website built in order to sell my eBook “How to Quit World of Warcraft”. – “Travel ‘n’ Tips“, my travel niche blog. I also own a blogging community, called “Klinkk“. I am 35, engaged, with many interests. First, I love to travel. I had the luck to visit many countries with my previous job, but I’ve gladly spent money for travel for pleasure to many destinations all around the world. I have fixed in my mind the skyscrapers of Dubai, the never ending fun in Las Vegas, the fantastic sunset of Santorini, the colored market in Barcelona or the amazing beaches in Venezuela. I could go on and on again : this is what I love of traveling, I do not need any picture or souvenir, the best memories are recorded forever in my mind. And another big part of my life : I’ve always been fascinated by extreme sports. I did bungee jumping, canyoning, rafting, free-climbing, diving, snowboarding, kick Boxing. And I am now learning how to skydive (actually just ended the official training last weekend). How were the initial few months of your online startup? Especially at the beginning, you need to build your name or brand. I mean an online reputation. People are less likely to visit your blog or trust you, if they do not know you. So I strongly suggest new bloggers to start their online adventures while they still have a full time job, or else another steady income. Because you will need several months, or even years (depending on the time you invest in your online startups), before building a consistent source of income online. What are your major income sources? I mainly make money online from selling ads on my blogs. But I have different income sources, as sponsored posts and reviews, affiliate products and some sales from my eBooks. How did you hear about DoSplash? I remember the first time I heard about DoSplash. What are your views on blogging communities? I prefer to point up the benefits in terms of relationships you can receive from being active in blogging communities, instead to mention any SEO benefits of “link building”. I’ve met several new friends just for using the most popular blogging communities. And friendships are forever! Also, you can get targeted traffic for sharing your content, as you share the same interests of the other users. Briefly tell the DoSplash community 5 blogging tips that you think are most important. You should pick a topic for your blog, you are always inspired to write about. People will see the passion you devote into it. It’s important to create relationships online with bloggers who have the same interests of you. You can learn so much from them! You need passion in what you do, or you will lose interest and persistance in future. Remember constancy. As for anything else, your online success won’t be overnight. And one big tip for every of your business : DO NOT PUT ALL YOUR EGGS IN ONE BASKET. In other words, you should create more than one blog, with different sources of income and diversify your online activities. You never know if the near Google update will hit one of your blogs or if someday you will lose your main source of income. What do you think about DoSplash? Any suggestions for improvement? The design is great, I love the new theme since the latest change. I know you’ve done your best to make the site user-friendly and fix the bugs. I would suggest to run your first giveaway or contest. In my experience, these initiatives could boost the community engagement and interest. Thanks for taking the time to answer the questions. Please give your message to the DoSplash community. I would be happy to connect with you on DoSplash, check my profile here. Or if you prefer, visit my social accounts on Twitter, Facebook or Google+. My wishes for all the best! Thanks Erik for taking the time. Now, have I missed a question? Feel free to ask Erik in the comments below! I know Erik because of blogging community “Klinkk”. Few days ago my account was not working of Klinkk. I contacted him personally via Facebook and he solved the issue so quickly. Really helpful person in blogging era. God bless him and you Jane. Thanks for the kind words, Gagan. You see, I think there is no much difference between online and offline world. It takes so little education and politeness, to make life better. Interesting interview and interesting things to learn about Erik. It’s been really exciting having you around and interacting with you Erik. I was not aware we are peers, Enstine. And I am glad you enjoyed the curiosities in this interview. This is a wonder surprise. I have just interviewed Erik Sir and posted a few days ago. You explored more of that amazing marketer. He provided me some awesome tips also to improve my blog. Nice to be here again after a long gap! Yes, I am here today via Erik’s page where this post has been mentioned and I posted the following comment there. Hey Erik, I am really surprised to read about your adventure travel all over the world and the passion towards skydiving! I do not need any picture or souvenir, the best memories are recorded forever in my mind. So please do take pics on your journey and make an album too!